Once upon a time, a cap seller was travelling by walk through a forest to a nearby village. It was a very sunny day so he decided to lie down under a tree and take rest for sometime till the sun sets down. As he was very tired he slept quickly. When he was sleeping a group of monkeys came down the tree and pulled the cap seller's bag. They opened the bag and found the colorful caps inside it. 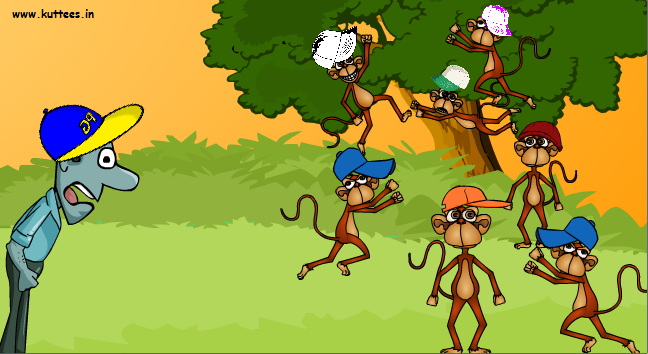 The monkeys picked up the caps and climbed back up the trees. The cap seller woke up after sometime and was shocked to find his opened bag and the monkeys all having his caps. 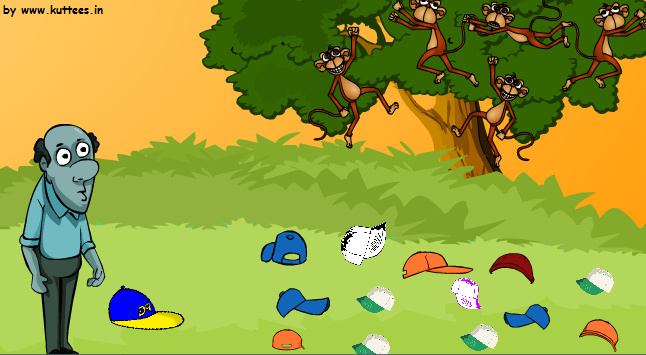 The cap seller became very angry, he shouted at the monkeys in the tree. 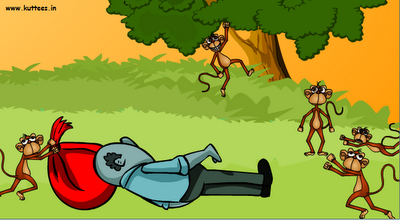 The monkeys shouted back at him. This made the cap seller more angry. He picked up few stones from the ground and threw them at the monkeys. This time the monkeys threw the fruits they had in their hands at the cap seller. The cap seller was surprised by this behavior of the monkeys. He thought for a while. This time, he removed off the cap, he was wearing and threw it on the ground. The monkeys that were watching him also did the same. They threw all the caps on the ground. The clever cap seller collected all the caps, packed them back in his bag and moved away from that place. MORAL : Clever thinking can easily solve a problem. Years passed by, after many years, the grandson of that cap seller was again walking through the same forest with his bag of caps. He slept under the same tree and even this time few monkeys took the caps and went back to the trees. When the grandson woke up and found the caps on the monkeys' heads, he remembered the story of his clever grand-father. He waved his hands at the monkeys for which the monkeys too waved their hands. He picked up a stone and threw at them. The monkeys threw the fruits they had at him. The grandson smiled to himself and threw his cap on the ground. For this, one of the monkey from the group came down and picked up that cap and ran back to the tree. From the tree, that chief monkey said to the grandson - "do you only have a grand-father, even we do" and laughed. The new cap seller was shocked and didn't know what to do. Greetings and thank you for the comment. We are sorry that you didn't like this story. If you could kindly, explain a little more about why you didn't like this story, it will be very helpful for us to avoid that mistakes in the future. This is an advanced version where the monkeys had realised their past mistakes and became wise. Once a fool, not always a fool.